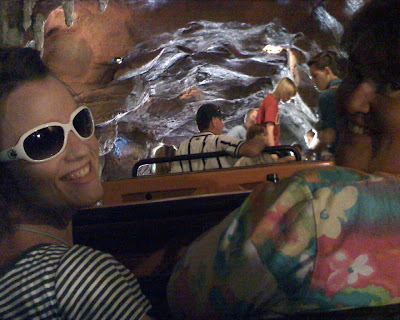 Here is a picture of Patti and Danneel in the tunnel incline on Great Thunder Mountain Railroad at Disneyland. We were enjoying the ride and then all of a sudden it stopped right under the waterfall. The loudspeaker came on and told us to sit tight and they would be along in a few minutes. They told us not to move around in the cars until they were able to chain it down and immobilize the coaster and make it safe. We sat tight. After a few minutes they turned off the waterfall. A little bit later some boys came along, chained down the coaster, and started helping people out from the front first. You can see in the picture that they are helping some people out of the cars in front of us. It wasn't that big of a deal, I mean how often are we able to see backstage Disneyland? 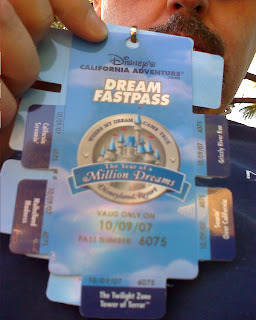 We were using up some "Year of a Million Dreams" passes when the train broke down. 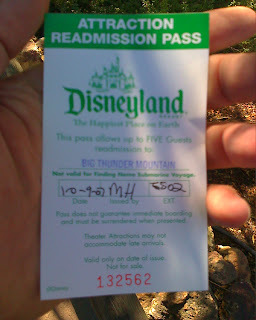 Fortunately they gave us some replacement passes to get back on the train, after they finished fixing it of course. That was almost a year ago, but I figured what the heck it is a matter of interest that I could include on my blog. Those dream passes were a gift from some castmembers that were passing them out as we were getting off an earlier ride on the same train. Patti was waiting for Danneel and I to finish the ride. When the ride was over I stayed behind to take a picture of the train, when I heard Danneel yelling at me to hurry that they were "passing out dream passes!" I had just got through telling Danneel and Patti to flirt with all the castmembers to get them to give us a dream. I was lucky they were running out of passes. We were able to get Patti a pass too calling her into the exit. WOW - that was almost a year ago - no wonder I am getting the itch to go back - oh thats right I am going again on RAINBOW WEEKEND! Sorry Patti - hopefully Paul will be my ride partner from now on - you're gonna have to stick with Treb!